Whilst not as ancient as the Remuh, the New Cemetery is equally as atmospheric, and some would say more so. It was founded in the early nineteenth century, and many distinguished townsmen were buried there. Certainly, if you like to lose yourself in a rich gothic ambience then this would be unlikely to disappoint. For it has all the qualities of the Remuh, but on a much larger scale. Even the gravestones themselves are taller, often reaching six foot in height. And here the tombs can be found not in the hundreds but the thousands. Some are bent over, whilst others have collapsed entirely, and the whole ensemble weaves a potent and beguiling spell. In some respects the cemetery feels more like a wood than it does a graveyard. In Spring and Summer, the trees are so dense that they form a thick canopy, and there is a constant trill of birdsong. 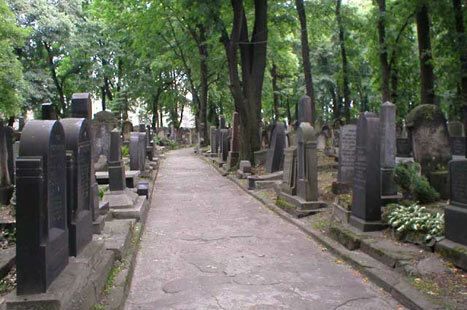 In spite of the passing of time, many gravestones are well preserved and they are more varied than at the Remuh. Dragons, doves, stags, griffins, eagles - you could spend hours admiring the many different motifs. Overgrown and mysterious, the New Cemetery is not to be missed.